The solution to my contacts is multipurpose. I've been writing about my adventures with contact lenses, namely with Biomedics 38 and Biofinity, but I have yet to write about the solutions I use to clean my contacts. So, what have I been using? 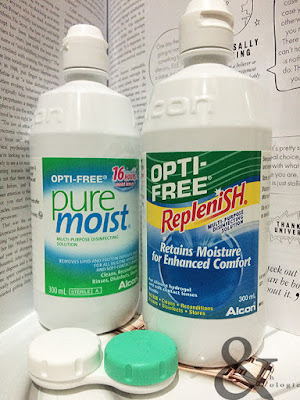 I was recommended the multipurpose solutions system right from the start, and both Opti-Free Pure Moist [eBay | Boots] and Replenish [Vitacost | Walgreens] are multipurpose solutions, in that you will only need one bottle to clean, disinfect and store your soft hydrogel and silicone hydrogel contacts; unlike a hydrogen peroxide-based cleaner which requires another solution either before or after cleansing. The only thing that mainly separates Pure Moist and Replenish is rubbing. One requires it and the other doesn't. If you take a look at the box insert which I suggest you should, you'll see the safety information and instructions that I think are simple enough to follow. Replenish requires rinsing each side of the lens for five seconds before storage, but I give my contacts a little rub [with the solution] prior to rinsing anyway just because I'm thorough. With Pure Moist, you will need to rub each lens for twenty seconds before rinsing each side of the lens for ten seconds. I call Replenish 'regular' because I don't think it's a bad solution; a bad solution would be stinging your eyes or cause infection. Replenish is none of those. But I feel Pure Moist offers something extra compared to Replenish. With the same contacts, in this case Biofinity, I feel more comfortable and feel comfortable longer when I use Pure Moist. For example in an air conditioned room, with Replenish, my eyes almost always get immediately dry and I would have to constantly blink to the point of annoying. With Pure Moist I would have to literally have the air conditioner or fan blowing at my face before I have trouble seeing. So, no matter how convenient the no-rub is, I feel the extra comfort is worth all the rubbing. With daily use, a bottle of both solutions lasts more or less a month. Pure Moist might finish a bit quickly because of all the rinsing needed. After about five months of use of both solutions [not at the same time], I haven't developed any kind of allergic reaction. Considering people with eczema or those with allergic tendencies in general are much more prone to have an allergic reaction, I have been lucky with these solutions, and surely enough I have a history of eczema. Which contact lens solutions do you think is the best?